The devices blink red when a driver gets too close to a rider. 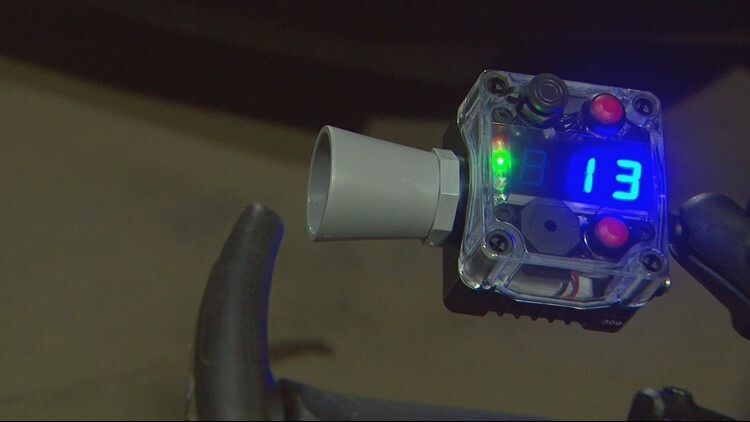 GRAND RAPIDS, Mich. - The Grand Rapids Police Department received some new gadgets on Tuesday that officials say will help them enforce the five-foot distance required by drivers when passing a cyclist. The ultrasonic radar attaches to an officer's bicycle and captures the distance between the handlebars and passing vehicles. If a car is within five feet of the bike, the device blinks red and records the incident. In the state of Michigan, the law for drivers is a three foot distance, but in Grand Rapids, it's five feet. Fatal crashes involving bicycles have dropped over the years with the advent of the Driving Change campaign, but there’s still a lot of room for improvement, said Grand Rapids Police Sgt. Allen Noles. Grand Rapids police is the first department in the state to receive the technology for the federal pilot program. Officers trained with the devices on Tuesday, July 10. The second participating city is Knoxville, Tennessee. Like the state of Michigan, Knoxville has a three-foot safe passing distance. The tool will clear up the question of enforcing the passing ordinance in the city, said Grand Rapids Traffic Safety Manager Chris Zull. Under the system, bicycle officers would call a patrol call to stop a vehicle disturbing the five-foot passing boundary. Drivers pulled over in the first three to four weeks of the program likely won’t be ticketed, Noles said. Violators of the ordinance can be cited with a municipal civil infraction. The research program runs through October, but GRPD gets to keep the two radar kits.